Is there a "Step-by-Step" guide? Do all members of my club need to register also? What's the difference between a League and a Ladder? How do I run competitions? 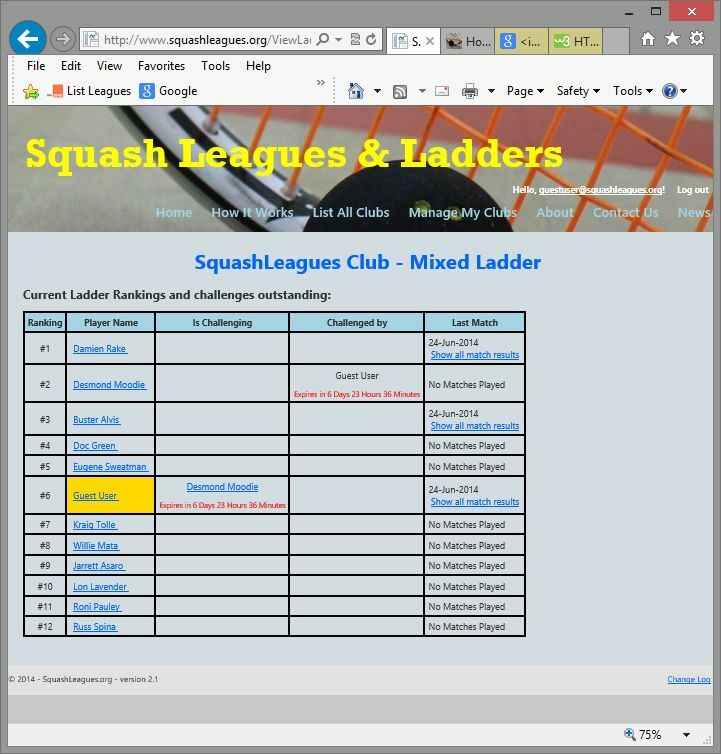 How do I start to host my club's leagues and/or ladders on the site? How often do I need to update the site? How many leagues or ladders can I host? How many divisions can I have in each league? I have a lot of members to add - do I have to add all of them individually? What happens if a player enters a score incorrectly? Yes there is - two in fact! If you want to set up a Squash League, you can view and/or print off a "step-by-step" guide for Squash Leagues containing information enabling you to set up and run your own club's league or leagues, with multiple divisions in each league, each with its own league cycles and possibly using different rules for promoting/relegating players. If you want a quick look at how a league will look, once it's been set up, view a sample league here. If you are more interested in establishing a Squash Ladder, then refer to the "step-by-step" guide to running a Squash Ladder for setting up and running your own club's Squash Ladder. The site allows you to establish as many ladders as you wish and you can customise the rules for each ladder separately. If you want a quick look at how a ladder will look, once it's been set up, view a sample ladder here. Return to list of questions at top of page. You don't have to register to use the site. You are using the site right now! However, if you want to have access to any of the pages that contain personalised information, then you do need to register. This is to protect the privacy of personal data. The only data you can access without first registering, if the list of clubs currently using the site. Once you do register, you will be able to create your own section of the website, which will be accessible only by yourself and the club members that you, as the "Club Administrator' grant access. Do all members of my club also need to register? Anyone who wishes to have access to your club - to view the league positions, update scores, etc, needs to be able to login to the site in order to confirm they are eligible to see these details. When you add members to the club, each member is sent a personalised email containing a temporary password and a link they they should click on to validate their email address. This process then enables them to use the website as a member of your club. They cannot, however, perform those functions that are restricted to the Club Administrators. Any Club Administrator can grant any other member of the club Administrator privileges. A League consists of several Divisions, each with 4 to 6 players of a similar playing ability. Every League Cycle (usually around 4 or 5 weeks duration), each player a specific division should try to play all of the other players in that division. At the end of the League Cycle, the Administrator 'rolls-over' the League Cycle to start a new cycle, but before doing so, the system allows for players to be promoted or demoted from their existing divisions into higher, or lower divisions. For example, the system can be set-up so that the player who is number one in a division is promoted to the next higher division and the player at the bottom of the division is demoted by one division. A ladder, on the other hand, is a single long list of players - ranked according to their ability. It doesn't have 'cycles' as such but every time two players have a match, the ranking of the players can be amended. Any player can challenge any other player who is above him/her on the ladder, and if he/she wins the match, then that player is repositioned immediately above the player who is beaten, and all players inbetween are moved down one position. The system allows the adinistrator to decide how many players above them, a challenger can challenge, and also after what period a challenge is deemed null and void if no result is entered. 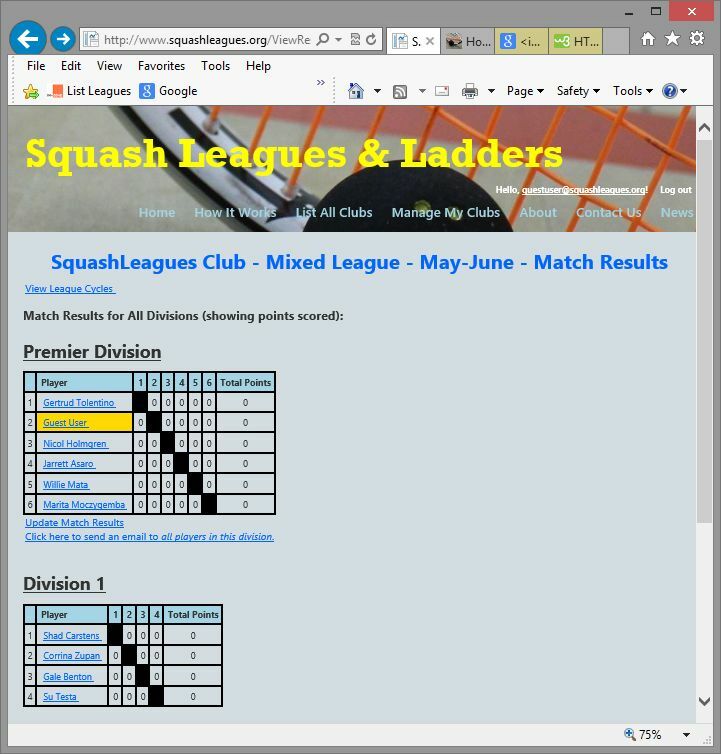 The two screen shots below illustrate how a League and Ladder looks on the site. Running a squash competition is not as straightforward as it sounds - although it's not rocket science either! We have a whole section dealing with running competitions. That section also has some great free tools to assist you. Once you have successfully registered, you can start the process of creating your own sub-site for your members. You start this by adding your club details. Then add the details of each League or Ladder that you want to run. Each league or ladder must have a unique name, so that your members can tell which one they are in. For each league, you must create separate divisions - again each with a unique name. You must add the details of each member of the club, too - just email address, and name. Finally, allocate the members to the correct starting divisions within their respective leagues, or add them to the appropriate ladder in the right ranking - and you are all set. This may all sound quite complicated, but it's not - you can have it all set up within 30 minutes. Clubs can use any scoring system they choose to decide the winner of each game - for example either Point-a-Rally (PAR) or point on serve only - first to 9, 11 or 15 or whatever the club chooses. Most international clubs seem to play PAR-11 nowadays. Matches are decided by either first to three games wins or best of 5 games (all 5 games must be played). The club administrator can decide which to use. A club administrator can also make manual adjustments to the division in which a player is placed - in case of 'extenuating circumstances'. For each ladder that you set-up, you can decide on both the period after which challenges expire, and also how many places above them, a player can challenge. If you are running leagues, and if all players update their match results themselves (which they should), then the administrator should only need to update the site at the end of each cycle - usually every 4 or 5 weeks. At the end of each cycle, the administrator should 'roll-over' the cycle to a new one. At this time the administrator will choose how the players will be repositioned in the league divisions, if at all, according to their final positions in the divisions for the current cycle. It only takes a few minutes to do this, as the system does all the hard work! This is also a good time to add any new players that wish to join the league. That's all there is to do on a regular basis. If you are running a ladder, then ths will look after itself and you only need to get involved in the case of disputes and/or players dropping out or asking to join the ladder. There is no limit to the number of leagues and ladders each club can have running at the same time. The only requirement is that each League and Ladder must have a name unique within your own club - so that your members don't get confused by the naming. Each League can also have an unlimited number of divisions - and again each Division must be uniquely named. There is no limit to the number of divisions in each league of your club. The only requirement is that each Division must have a name unique within any given League - so that your members don't get confused by the naming. No, you don't need to add your members one-by-one = although you can do if you don't have a lot to add. If you want to add many members all at once, you can do this easily and quickly. Prepare a file using notepad or any editor, that contains the required fields for each member (first name, last name and email address), upload this to the site and then process them all in one go - it's that simple! As each ember is added to your club, the site sends an email to the member asking them to confirm their email address and complete the registration process. They will then be allowed to log-in to the site and view and update their league results. If a player enters the wrong score, it's not a problem - either of the two players for that match (or the administrator) can update the score by re-entering it correctly. The division positions are automatically recalculated to take account of the revised scores.